All images by Peter Bennetts. The brief for Andrew Maynard Architects’ Tower House defied traditional residential requests, with the practice asked to design a space that would serve the dual purpose of home and village. The client, a family with young twin boys, asked for a home that would serve as a place to bring together community, art and nature. 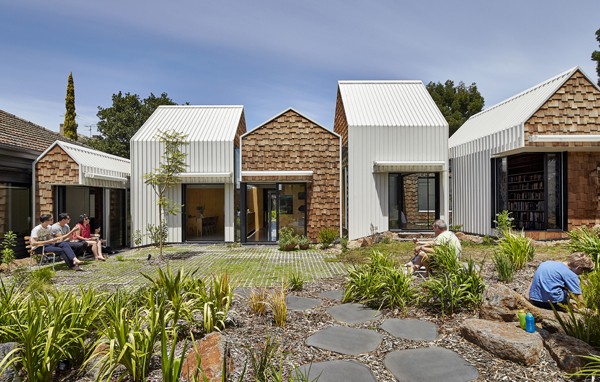 What Andrew Maynard Architects produced is certainly breathtaking and innovative. Its use of small structures and spaces adds to the ‘village’ aesthetic. The rooms are connected internally through separation in ceiling and plan as opposed to using walls and doors. Furthermore, the house is able to transform from communal to private, with the home containing hidden sliding panels that allow the rooms to be closed off for privacy. This enables ease of interaction between family members, but the client is not bound by the open plan nature of the home and can retreat in private without disruption. The client requested a fluid connection between indoor and outdoor spaces, with the detailing of the project lending itself to a seamless transition between areas. The project’s exterior visually represents a village, with different interconnected garden areas allowing the space to be segmented off for various activities. A communal vegetable patch has been built in the front yard, encouraging interaction between neighbours and promoting a healthy lifestyle within the local community. 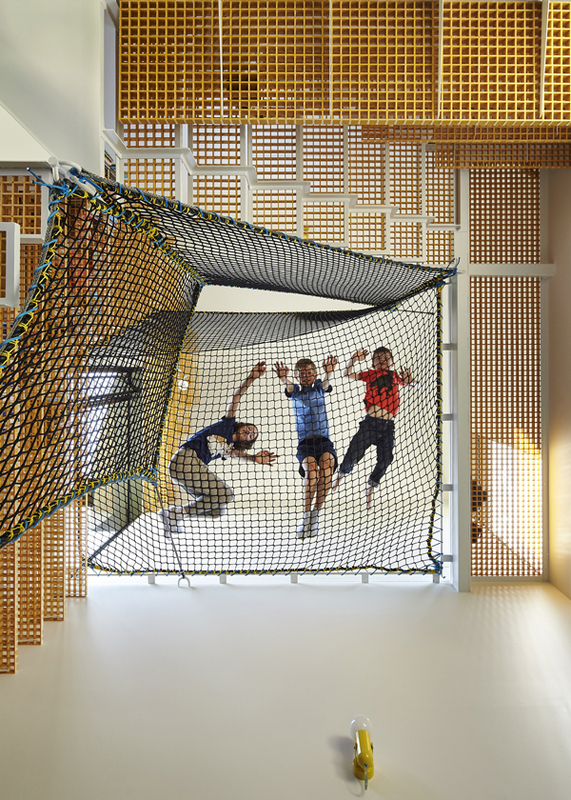 The project also utilises a range of materials not traditionally found in the residential space. 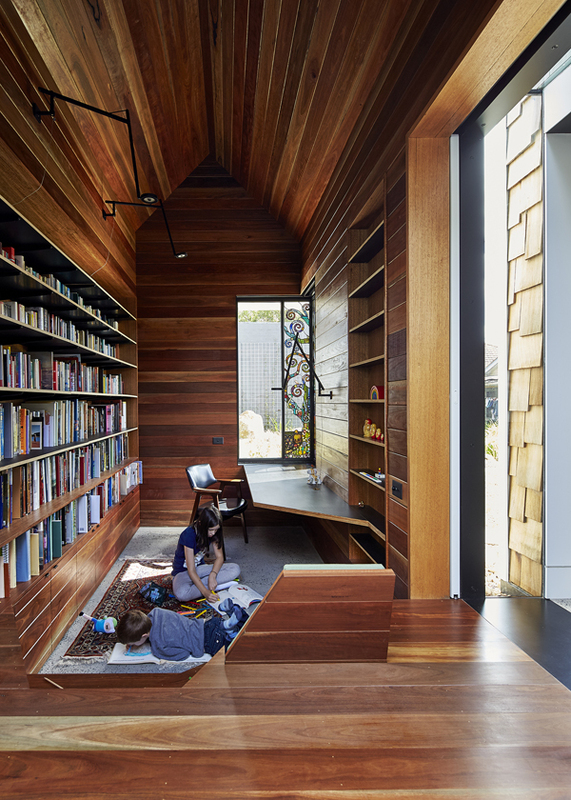 Andrew Maynard Architects’ use of netting, fibreglass grating and timber shingles within its interior is unique, and further separates the project from the average family home. Sustainability is at the core of Tower House, with double-glazed windows and openings designed to maximise access to the sun. On the other side of the spectrum, shade has been actively managed in the design, rendering air conditioning unneeded. The project is anything but ordinary, and it comes as no surprise that Tower House was last week named a winner in the 2015 Houses Awards.